My family and I went for a weekend getaway to visit some relatives close by and of course my sister. Initially, I planned on writing about local eateries and writing reviews about their food and my experience, but we didn’t really end up going to as much restaurants as I anticipated. Obviously I was disappointed that I didn’t go to all the places that I wanted to go to, but I think I wouldn’t have the same perspective as I do now and for that I am thankful for not going through with my plans…at least this time. My aunts and uncle came over the U.S. early on. I remember receiving packages from them containing huge bars of chocolate, soap, some shirts or shoes ever so often. They had good jobs and worked extremely hard for the things that they have now. It’s common in Filipino culture for relatives to send these packages as gifts or even go to the extent as paying for one or two of their nieces’/nephews’ education. Growing up, I depicted them differently. I thought, because they came to the states and because of all the things that they were giving us, that they were very financially endowed. Despite of that having some truth or not, what I should have concentrated on was the fact that they were sharing their good fortunes with most, if not everyone in the family. They could have kept their earnings to themselves but they chose not to. The keyword here is choice. I genuinely believe that we can have all the things that we could ever want with just some good honest work, but to choose to share it among others just says a little something about one’s character and humility. Materialistic and financial gains come and go, but the sentiment that accompanies the knowledge that you made someone’s life that much better because you made the conscious decision to share what you have, is something often unrecognized and undervalued. Having the privilege to see this is priceless in itself and it’s something that will most definitely fortify my values as a young person. So, I’d like to dedicate this to them and anyone or everyone who made that difference in someone’s life. It is much appreciated. Needless to say, they were more than willing to open their homes to us during our visit. They cooked meals for us and made sure that we had more than enough to eat. Those restaurants I wanted to visit may have had a completely different cuisine or service or whatever, but I shouldn’t be complaining I didn’t get to go because I got to have home cooked dishes. More importantly, some of the dishes I rarely had growing up in North America. Particularly, this warm dessert called bilo-bilo. I remember my mom making it maybe once or twice and it was always a treat when she does make it, so of course I was more than delighted to see that my auntie made it for us. Despite of the dish’s multiple components, its simplicity as a whole is quite comforting and elegant. Bilo-bilo actually refers to the rice balls in the dish. Bilog in Tagalog means round and so the literal translation of the name of the dish might be “round-round” (they just cut off the g from the word I guess?). I know that the meaning isn’t really as interesting, but at least it makes sense! Making these bilo-bilo is as simple: glutinous rice flour and water. You know what the best part is? There are no exact measurements for it. I love that! You want to know why? Cooking doesn’t require exact measurements. Most of the time measurements are just approximate guidelines for ingredients. I mean how many times have you tried to make someone else’s recipe(s) but you just cannot make it the same way they made it? Cooking is one of the only activities that require for you to use all of your FIVE senses. Why not exercise these sense?! So, how do you know that you’ve made the rice balls right? Consistency. The safest way to tell is to add a little bit of water at a time. My auntie says that when you can mold the mixture into a ball and it holds its shape, then the consistency is good enough. What else could you have in this dessert? Often you’ll see some purple yams or sweet potatoes, saba bananas, round kaong (sugar palm), lanka (jack fruit) or even small pearl tapiocas as toppings aside from the bilo-bilo. When you have all of these or some of these ingredients prepared for cooking, in a pot pour in some coconut milk. Let the coconut milk boil before you put in the rest of the ingredients. 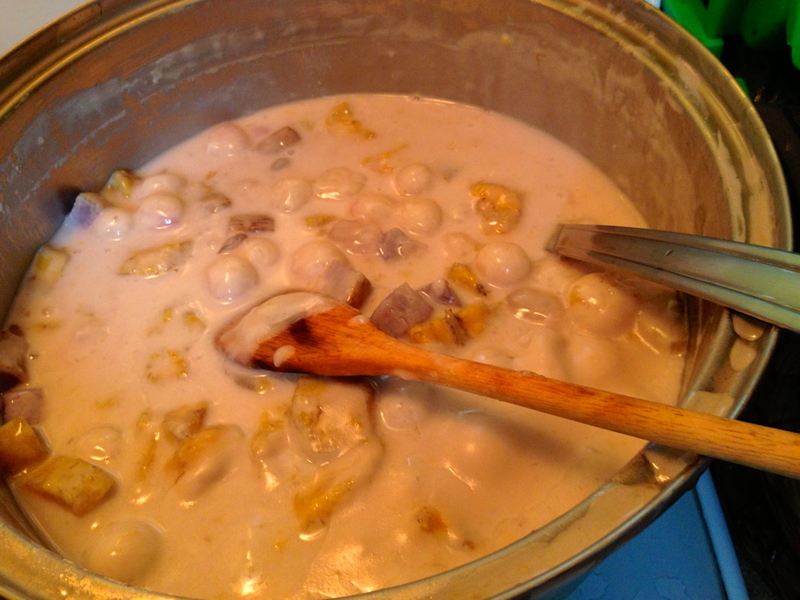 Once the coconut milk is boiling, reduce the heat to medium and add in the purple yams and wait a few minutes before adding in the bilo-bilo. If you do decide to have the purple yams, you’d need to put them ahead of the bilo-bilo because it won’t cook all the way through if added later on. Anyway, you know that the bilo-bilo is done when they surface the coconut milk. When they do surface, you can go ahead and add the saba bananas and kaong (all of it with the syrup so you wouldn’t need to add sugar later on). Both of which won’t need as much cooking time so make sure to check before they turn into mush. You can add some pearl tapiocas if you want, but those need to be prepared separately then added in the mixture at the end (when you cook the pearls stir them constantly and make sure that there’s enough water for the pearls to soak in the water; you’ll know when they’re done when the middle part of the pearl is no longer opaque and hard, but more transparent). After everything is cooked all the way through, that’s pretty much it. You can wait until it cools down a bit or you could eat it while it’s hot. I’ve had it hot and cold; the consistency of the coconut milk does change when it’s cold but it doesn’t completely solidify, more like a soft melted ice cream texture. I do prefer eating it warm because you can distinctly taste how harmonious the dish is while still being able to taste each individual component. It’s such a simple dish to make, but the taste is quite complex. It is not an overly sweet dessert but it’ll also satisfy a sweet tooth. The sweetness of the coconut milk and kaong syrup resonates throughout your tongue, yet it is also used as a vehicle for the savoury flavours of the bilo-bilo and purple yams. Meanwhile, the bananas unify the savoury and sweet components into a well-balanced spoonful of layered flavours. I mean really, after that, would I want to go to a restaurant? Maybe, next time.